Payday lending companies offer a legitimate and convenient way for employed individuals to get money when they need it. These companies provide a quick source of money that can surely help a borrower pay for unforeseen expenses. True, payday loans have high interest rates, but they can help you whenever you find yourself in a tight financial spot. Even so, you need to be careful when applying for this type of loan, as there have been many scams linked to fake payday loan providers. 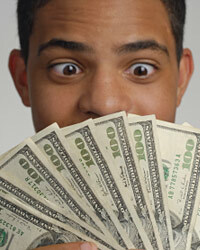 Here are some tips to avoid being swindled when taking a payday loan. CFSA stands for Community Financial Services Association. This was established to protect consumers and to promote the regulation of the entire payday loan industry. In other words, when it comes to payday lending, CFSA knows what the best practices are. So, when applying for a payday loan, make sure that the lender has been certified by this organization. If your lender’s website has the CFSA seal, you can be assured that you are dealing with a legitimate loan provider. Third-party lending sites basically accept applications from prospective borrowers and submit those applications to various lending companies. At first glance, this may look advantageous and convenient, as you no longer need to pass your application to each lending company you encounter. The only problem is that you would never know if the third-party site where you submitted your personal information is selling your personal details to other interested parties. Some third-party sites also offer free trial services only to automatically charge your account after the trial period ends and even if you do not have subsequent use for the services offered. You may think that submitting applications to all the different payday lending companies you encounter will increase your chance of getting a cash advance. Well, multiple applications do not guarantee loan approval. Worse, most lending websites charge processing fees each time you fill out an application. This means that you could be spending a lot of money even before your loan gets approved. There are many fraudulent online businesses that pose as legitimate payday lending companies. These entities take advantage of people who are in desperate need of money, so you really have to be extra careful when shopping for payday loans online. One way to separate the fake from legitimate loan providers is by checking and locating the physical business addresses of the lenders. Real payday lenders do business not only via the Internet but also in their brick-and-mortar establishments. Payday loans are some of the widely marketed products online. Many companies resort to sending unsolicited offers to attract consumers. The problem is that many spam and phishing sites also use the same online marketing technique to spread malicious software and steal other people’s personal information. Just to be safe, ignore payday loan products that you did not ask for.